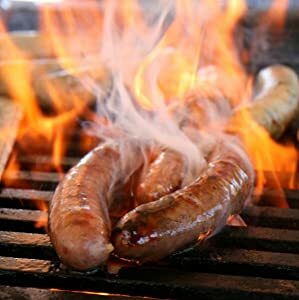 I love outdoor cooking, when we talk about outdoor cooking the one thing that comes to our mind is “Gas Grill” or “BBQ Grill” right? 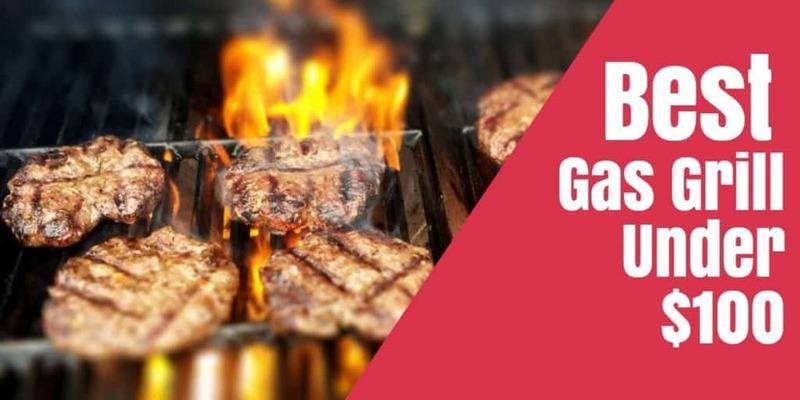 If yes then we have this article to provide you information about the Best Gas Grill Under $100, yeah you heard it right you can get Gas Grill for just under $100. 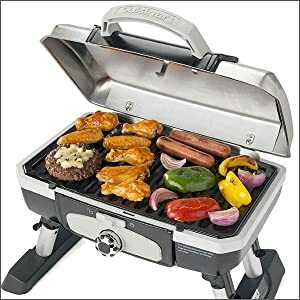 Cuisinart CGG-180T Gas Grill is in #1 place for Best Gas Grill Under $100 in BuyersGuideX for some excellent and valid reasons. 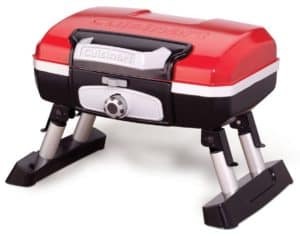 Cuisinart CGG-180T is a portable gas grill which can be used both indoors and outdoors. 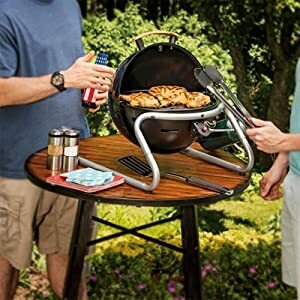 It has 145-square-inch grilling area and foldaway legs. It comes with two styles, and those are Tabletop, Tabletop with Stand. It has Powerful 5,500 BTU stainless-steel burner and even-heating porcelain-enameled grate. 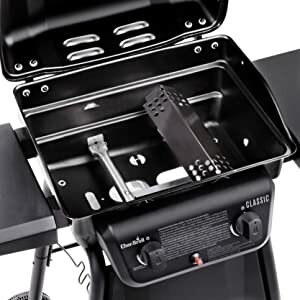 Cuisinart CGG-180T is not like the other gas grills because it is Stainless Steel Petite Tabletop Grill is reliable and durable. It’s small in size but cooks as well as a full-size grill. It’s fueled by propane and features a twist-start ignition for natural lighting. Cuisinart CGG-180T fits perfectly anywhere. You can use indoor and also outdoors. The compact size keeps the heat near the cooking surface, making it more energy efficient than large grills. 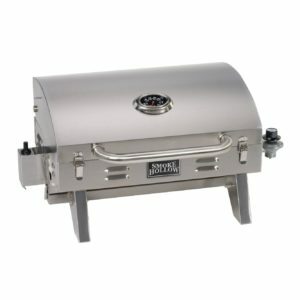 Char-Broil Classic 280 is one of the most affordable and also premium gas grill that is available on the market. It is ranked No 2 in our list of Best Gas Grill Under $100. It is a 2-Burner gas grill with 280 square inch cooking surface which can easily accommodate full meals for a big family. The cooking surface measures 20-inches wide by 14-inches thick, and features porcelain-coated grates, which help prevent food from sticking and are easy to clean. Char-Broil Classic 280’s grill Grill lid and firebox are constructed of porcelain-coated steel which is scientifically proven to increased durability- capable of standing up to tough weather. The primary cooking or grilling surface in Char-Broil Classic 280 features porcelain-coated grates and measures 20-inches wide x 14-inches deep. Which means you can easily cook 11-13 Burgers on the grill. Piezo ignition system provides fast and reliable burner start-ups with the push of a button. 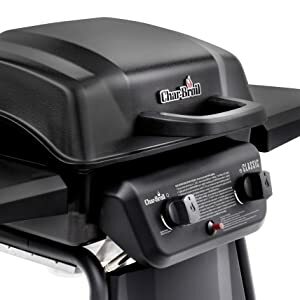 The Char-Broil Classic 280 gas grill has stainless steel inline burners which are durable for longer-lasting performance, and offer better high to low heat control which is a contradictional feature of traditional pancake burners. 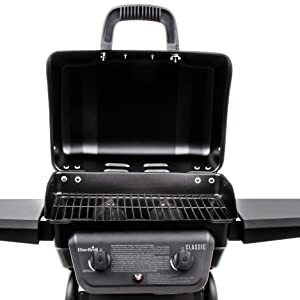 Smoke Hollow LS2016 is in the #3rd place in BuyersGuideX Best Gas Grill Review under $100 because of its slightly small grill size and slightly a bit expensive for its features, but still, it is recommended for it Brand and Long Lasting. Smoke Hollow LS2016 has a barrel size of 20 inches wide by 16 inches deep. 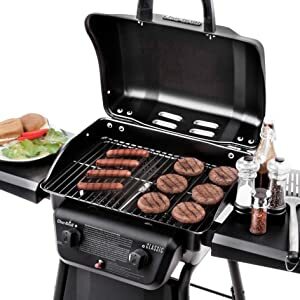 It has a really powerful 7,500 BTU stainless-steel burner and even-heating porcelain-enameled grate which is the highest of those two gas grills above. It also has Porcelain coated wire cooking grids, and heat tents provide a durable and long lasting cooking surface. 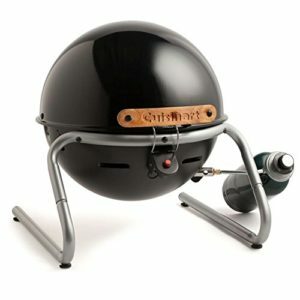 Another Gas Grill from Cuisinart. Cuisinart CGG-049 has a 10,000BTU burner which is the highest from all of these three that are listed above. Cuisinart CGG-049 has got 14″ diameter Dishwasher safe, enameled Steel cooking grate with the Push button ignition system. 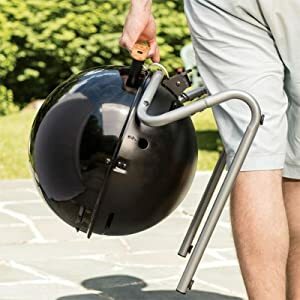 It is a portable gas grill so it can be carried anywhere and also can be used indoor and outdoor grilling. It is really innovative, lightweight, portable grill. 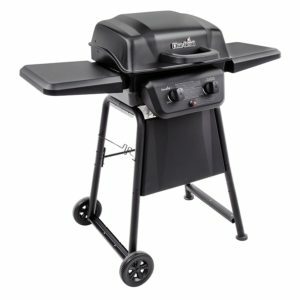 The steel grill features a locking lid, a wooden carrying handle, and aluminum legs that pull apart for storage. Cuisinart CGG-049 is a great size for burgers, steak, seafood, vegetables, chicken or kabobs. The hinged lid rotates out of the way to access the grate, and it only needs a 1 pound propane canister. The compact size is perfect for times when there’s no need for the large grill. It’s ideal for balconies, small decks, picnics, tailgating, and RVs. Last but not least, Smoke Hollow 205 is stainless steel with 10,000BTU U Shape Burner which is really rare to see in other gas grills. This U Shape burner allows the food to cook really well on the inside with the use of aerodynamics. Perfect for Tailgating, camping, picnics, boating or anywhere your travels take you. It has got 305 Sq. In. Cooking Surface and Leg Folds for Portability. Perfect for Tailgating, camping, picnics, boating or anywhere your travels take you. 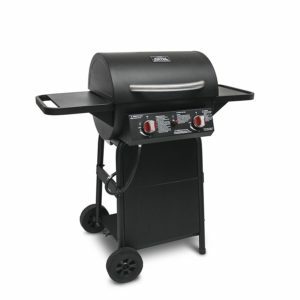 We have given our best suggestion on Best Gas Grill Under $100 or Top 5 Gas Grills under $100. Please do let us know if our recommendations are worth it or not. Thank You.